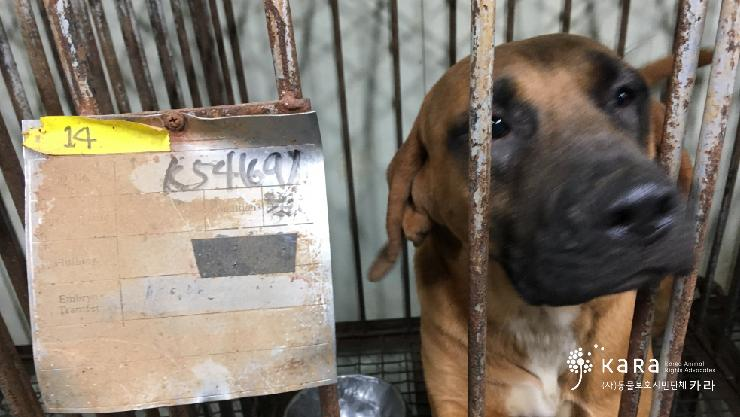 Below is the response from the Seoul National University (SNU) to our petition which supports investigation by Korea Animal Rights Advocates (KARA): Seoul National University, stop it! We demand the truth about your using “meat dogs” for cloning experimentation. Click HERE to learn more about this campaign. 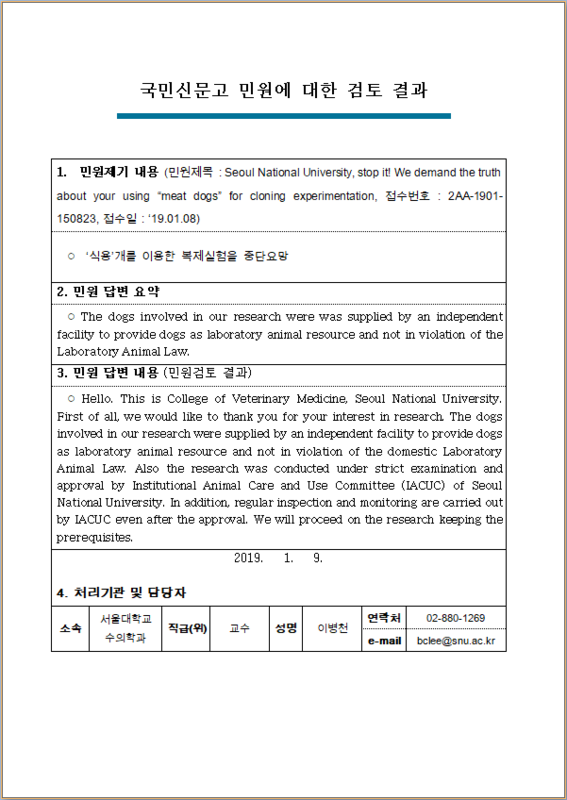 SNU responded by stating, “The dogs involved in our research were supplied by an independent facility which provides dogs legitimately as a laboratory animal resource and not in violation of the “Laboratory Animal Law.” It’s not clear if they are denying the allegations by Korea Animal Rights Advocates (supported by the testimonies, video and photo evidences) or if they are stating that the changes have been implemented now and that they no longer use “meat dogs” for their dog cloning experiments. 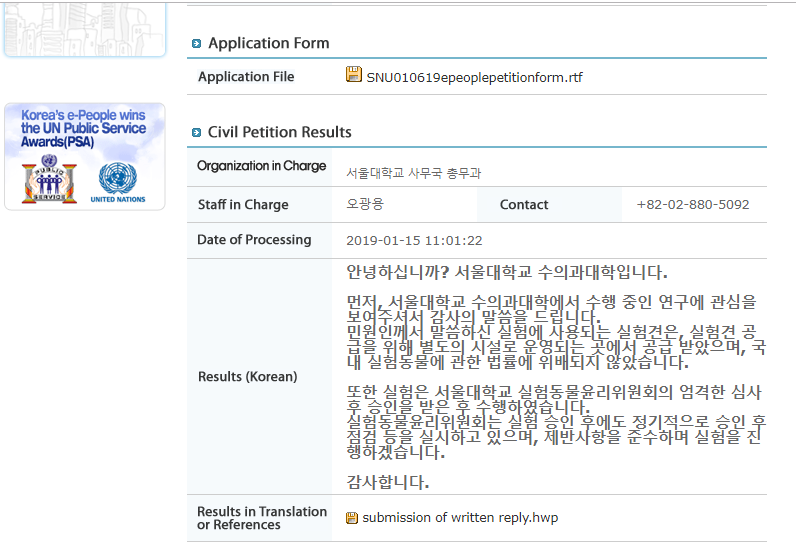 They have not addressed or responded directly to the majority of the demands by KARA listed in our petition. Our campaign is still effective because now they are aware that the eyes of the world are watching what’s going on in their veterinary school and their unethical and shameful dog cloning experiments which involve animal abuse and treat these dogs as experimental objects rather than sentient animals. 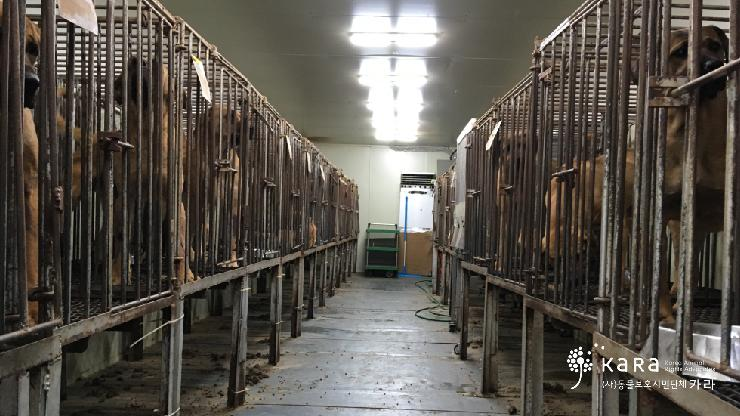 We hope that people who are considering cloning their beloved pet dogs will find out the terrible truth behind the Korea’s dog cloning industry, how this industry is only possible in Korea because of their poor animal protections and will not waste their money in supporting this cruel industry. We are thankful to the brave activists of Beagle Rescue Network and KARA for this investigation and their dedication to bring about change. Let’s keep up the pressure by taking action! S. Korea’s CRUELTIES Make my children cry! They know because they’ve seen photos, videos too of what S. KOREA DOES TO DOGS AND CATS IN LABS AND DOG MEAT MARKETS. THEY HAVE NIGHTMARES AND THEY KEEP ASKING WHY WHY WHY PEOPLE OF S. KOREA KILL AND TORTURE HORRIBLY THEIR FRIENDS? I TELL THEM THAT IT’S NOT ALL THE PEOPLE IN S. KOREA, BUT THEY STILL SAY THEY WANT PEOPLE TO KNOW AND LEARN HOW WONDERFUL DOGS ARE, HOW LOVED THEY SHOULD BE, NOT TORTURED AND KILLED FOR EXPERIMENTATION OR FOOD! FUTURE CHILDREN OF THE WORLD’S FUTURE IS IN YOUR HANDS TODAY, IN THE PRESENT WILL DETERMINE THEIR FUTURE! S. KOREA, CHANGE NOW! STOP AND EVOLVE INTO WHAT WILL BE A LIFE FOR ALL SENTIENT BEINGS, NOT A “HELL ON EARTH FOR ALL” AS YOU MAKE IT NOW! No one should ever visit this horrible country!! you think you can justify this horrific dog meat trade,you are wrong millions of people know about this now what I am reading also all the comments from around the world, your country is the last place anyone wants to visit, I know I would end up in jail if I ever stepped foot in S. Korea your people are barbaric evil heartless monsters. DOGS ARE MAN’S FRIEND AND PROTECTOR. THEY ARE NOT MEANT TO EAT. GOD WILL PUNISH THESE PEOPLE FOR KILLINGS DOGS. This savage and violent killing and eating of dogs and cats will only stop when the Korean people become civilized. They are at still barbaric savages with no compassion, no empathy, no soul. This is a evolution that will take thousands of years. The only hope for these little animals is extinction. And it could not happen quick enough. How dare they do this and then export their goods to the US for us to buy? Boycott all things Korean. Can’t believe how many so called animal lovers I see driving KIAs! Shame! stop killing these animals and stop hiding behind that you are doing research you are lying. we all know what you are doing and we are going to stop you! !